At the Mohawk Institute Woodland Culture Indian Museum in Brantford, Ontario in Canada there is a whole new world where one can discover the unique heritage and culture of Canada's past. 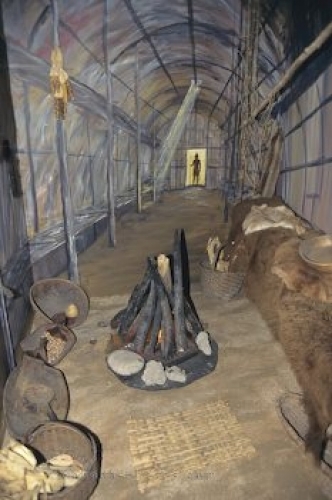 In this dome shaped exhibit, people can see how the Indians used to build their fires for warmth and to cook meals on. The Mohawk Institute Woodland Culture Indian Museum, Brantford, Ontario, Canada, North America. Picture of an exhibit at the Woodland Culture Indian Museum in Brantford, Ontario.